Medallion pattern flags are both majestic and eye catching. The period from the start of the American Civil War to the American Centennial is the pinnacle of medallion flag making in America, and this flag, originally owned by a man of unknown origins named William Cowan, is a wonderful folk art example of the form. Found in Waynesboro, Pennsylvania, the flag itself is made of an unusual combination of white cotton for the stripes and stars, red blanket wool for the stripes, and blue blended wool for the canton. 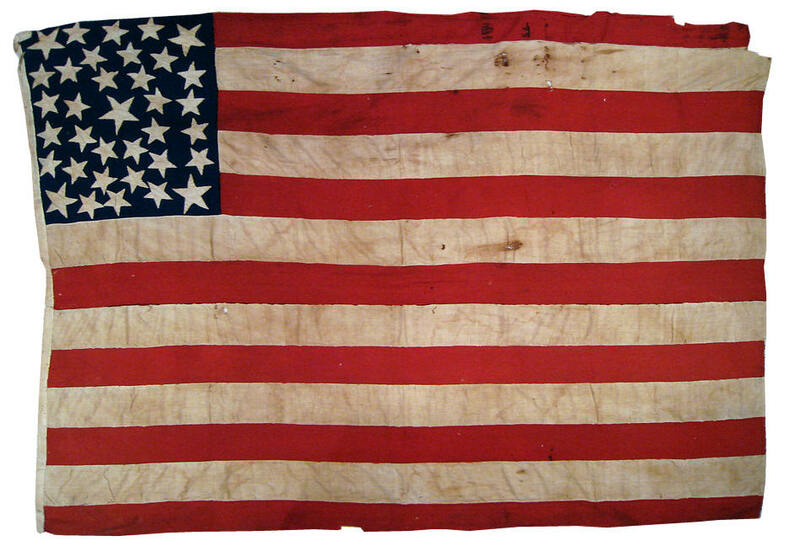 It's clear that the flag was made from whatever materials were at hand in the midst of the war. One unusual and charming aspect of the flag is that its canton only spans five stripes, rather than the typical seven stripes. While the diminutive canton is no less impressive owing to its beautiful star pattern, the form of the flag accentuates the stripes beautifully, and is stylistically reminiscent of earlier flags where the "broad stripes" have visual precedence over the canton. The rare star pattern on this flag can be visualized several different ways. Five large stars anchor the canton--one in the center and one in each corner. Although the smaller stars generally appear scattered and nearly random, they could actually be considered as an unusual "circle-in-square" medallion, with an outer square of stars, with three small stars along the top and bottom edges of the canton, and four small stars along the left and right edges of the canton. A wreath of eight stars surrounds the large center star, and above and below the wreath are two arched rows of four stars each.